This is the story of a color, a sign, language - militarized tones. 2008 Detroit. Near my house a bright yellow billboard appeared with big, bold, black Arabic text. 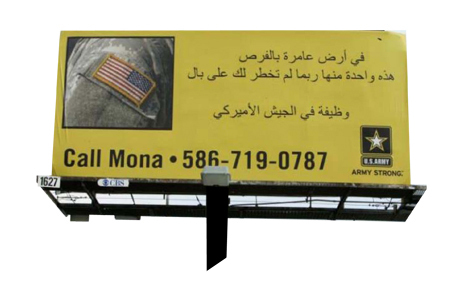 If you could read the Arabic they wanted you to call Mona for a special opportunity, the army was looking for translators. This was a sign, a double meaning, demographically targeting the neighborhood, targeting a language, its presence a daily reminder. The billboard left after a few months, but the yellow background stayed, that familiar tint of yellow has since tainted many countries and situations.